A second-half header from Zlatan Ibrahimović secured Manchester United their first European win of the season. Manchester United played Zorya Luhansk last night, in what was their second Europa League match of the season. The Reds didn’t look at their best, but they still managed to secure 3 points and avoid defeat. Wayne Rooney came off the bench to help Manchester United score their first and only goal of the match. His assist came 2 minutes after being subbed on. 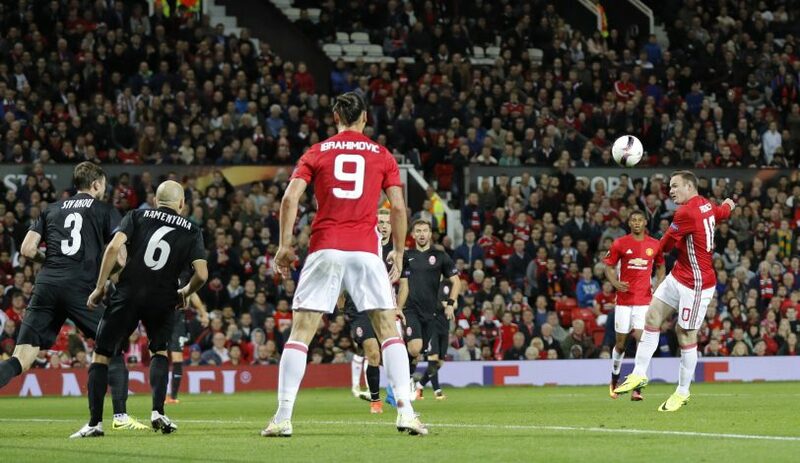 Ibrahimović managed to get on the end of a mishit Rooney shot to break the deadlock and secure United their first win in Europe this season. Jose Mourinho made four changes to his previous starting eleven, fielding Sergio Romero, Fosu-Mensah, Marouane Fellaini, and Marcos Rojo. Mourinho didn’t make any changes to his attacking players, as Zlatan Ibrahimović started in the lone striker position, with Juan Mata playing as a No.10, Marcus Rashford on the left wing, and Jesse Lingard on the right. In midfield, Paul Pogba partnered with Marouane Fellaini, although many fans would have preferred to see Michael Carrick start in the center of the park. United’s centre-back pairing consisted of Bailly and Smalling, while Fosu-Mensah and Marcos Rojo were deployed as full-backs. Manchester United came into the match expecting to have a similar performance to the one they had last weekend, during their 4-1 win against Champions Leicester. However, the Red Devils’ lackluster performance seemed to frustrate Jose Mourinho and the fans. Manchester United signed the 34-year-old for free this summer, after he saw out his contract with Paris Saint-Germain. Since signing for United, he has been the only player to feature in all 10 of Manchester United’s games this season, scoring a total of 6 goals. Impressive, considering he’s already 34. Zlatan looks to be the perfect man for Manchester United, as the Giant Swede is capable of scavenging goals. Ibrahimović looks to be adapting well with the United squad, although fans were worried that the Giant Swede would not be able to cope with the pressures of a team like Manchester United. He also looks to be United’s first choice free-kick taker, even with the likes of Paul Pogba, Wayne Rooney and Juan Mata around to argue with him. He almost scored from two of United’s free-kicks tonight, but will be happy that he managed to grab the winner. Jose Mourinho started the match with Marouane Fellaini and Paul Pogba pairing up in front of Manchester United’s defensive back four. However, there doesn’t seem to be a partnership forming between the two players, and it looks to be affecting Pogba’s performance. Paul Pogba has so far failed to justify his £89 million price tag. The Frenchman has only scored 1 goal in 7 appearances for Manchester United this season. However, many can blame Jose Mourinho for wrongly pairing the 23-year-old. Pogba is most suited with a player like Ander Herrera or Michael Carrick. Both these players will bring stability to Manchester United’s midfield, allowing Pogba to venture forward and practice his box-to-box role better. Fellaini has been in decent form for Manchester United this season, but Mourinho will have to make the decision on whether or not he should continue playing the Belgian with Pogba. The former Chelsea man looks to be enjoying playing in Mourinho’s Manchester United squad. Jose has been deploying Mata in the No.10 role due to Rooney’s recent poor performances, and it looks like the Spaniard is enjoying the role. Usually, Mourinho would start Mata on the right wing, but it looks like he is saving that spot for Jesse Lingard. When Mourinho was announced as the new Manchester United manager, many believed that Juan Mata would be on his way out due to the pair’s relationship at Chelsea. Mata left Chelsea in 2014 to join Manchester United after requesting a transfer away from the Blues. Many blamed Jose Mourinho, who was managing Chelsea at the time, for Mata’s departure. Almost everyone assumed that Mata faced the same fate under Mourinho at Manchester United. However, the Spaniard has managed to fight his way into Mourinho’s starting eleven, and has been very impressive so far. The Manchester United captain didn’t start during Manchester United’s 4-1 win against Leicester City, as many fans had begun calling for Mourinho to drop the striker after only scoring 1 goal this season. Rooney started on the bench last night as well, but had an instant influence when he was subbed on during the 67th minute. He managed to provide an assist for Zlatan’s winner only 2 minutes later. Although it’s only one performance, Rooney looks to be trying to fight his way back into Manchester United’s starting squad. During Rooney’s absence, Mourinho has been opting for Juan Mata in the No.10 role – a position in which the Spaniard seems to be enjoying. Only time will reveal whether Rooney can fight his way back into the starting line-up, but tonight looked to be a step forward for the Englishman. Depay has been struggling to fight his way into the starting line-up, and it seems that Mourinho has already made the decision to remove the player from the United squad. The Dutch winger will most probably be joining Bastian Schweinsteiger in looking for a new club during the winter transfer window, because it is clear that he hasn’t done enough to secure himself a starting spot. Memphis Depay has only made 1 start for Manchester United this season, which was during United’s EFL Cup tie against Northampton. The 22-year-old joined United last season, and looked to have a regular spot under Louis Van Gaal, making 45 appearances under the former United manager. Depay will face a mammoth task if he is to convince Mourinho that he is worth a start. Jose has so far opted for Anthony Martial and Marcus Rashford in Memphis’ left wing spot, so if Memphis is to fight his way back, he would have to compete with two in-form players. No doubt in-form Zlatan is the tonic for the team. On his back we ride to Champions League qualification plus many laurels this season.